"I do not know how to live without Roman, and the time does not cure. Good is that I have children for whom I live"
"A sincere smile of my husband will never be erased from memory. His kindness, strong shoulder on which I could rely so unexpectedly went into eternity. Love, miss and still do not believe that our dear Roman died", the first thing that Tetiana Abramova says, recalling deceased Russia-Ukraine war veteran a soldier of the 30th detached mechanized brigade Roman Abramov. The would-be spouses were introduced to each other by Tetiana’s sister. Roman was a friend of her husband. "Once they were having company. There I saw Roman for the first time. My sister and her husband wanted me to find myself a nice man and to get married. Interestingly, at first, neither I nor Roman liked the idea of dating. But then we got to talking and it turned out that we had a lot in common, the same outlook on life and similar interests", says the wife of the killed Ukraine Army soldier. After half a year the young people had a wedding-party. And soon there came a happy birth of Daniel, their first son. With the child, Roman Abramov began to pay more attention to the family and to help his wife. "I had a difficult pregnancy, and I had health problems even before. So Roman was always near me, helped me", says the woman. And two years later the couple enjoyed a second son Alexander. Tetiana says that the kids loved their Daddy, and he loved them. "He was with me at the birth, supported me. He was happy to hear each their word, was happy to have sons. He was very fond of strolling with them and cooking them, teaching them man's job", says the wife of Ukraine soldier. So Abramovs’ family lived, worked, had a happy life, and dreamed to educate children. But the war prepared for them a tragic ordeal. In the area of Russian aggression in Donbas, east Ukraine, Roman Abramov was at Savur-Mohyla, Donetsk region. When he called home, he did not tell the details to his not to make her worried. In the morning, the day of his death, he managed to talk to her. "At 5:50 am Roman called me and asked if something happened to him, to take care of the children and to put them on their feet and not to miss him. Then, I did not realize until the end, what he said", barely holding back her tears says Tetiana. On that day the Russian army constantly shelled the strategic height. In one of such attacks a shell that exploded nearby killed Roman. "For four days I could not get Roman on the phone. Then he appeared on the network. I was so excited. I thought I finally could hear his voice. I called him, but instead, I heard the voice of a nurse from the Dnipro morgue, she told me that Roman was killed. At first, I could not believe it and thought that might be a mistake. It simply could not be! But when I saw the body... it was my Roman, all burnet, but on the neck there was a silver chain", said Tetiana Abramova. "So I have to learn to live without Roman, and the time does not cure, it aggravates. It is good that there are children for whom I live", says Tetiana Abramova the wife of the veteran of Russia-Ukraine war in the East of Ukraine. Now the family of Ukraine soldier Roman Abramov -0 wife Tetiana and two children: 3-year-old Daniel and 5-year-old Sasha - live in the apartment, which they acquired with the help of the state. But the apartment needs repair. The children grow quickly and need clothes and toys. But most of all, they lack their father. They understand that their Daddy is a Hero, and know that he died in the war, but still hope that he will return. Let's not leave without support the family of Ukraine Army soldier Roman Abramov who was killed in Russia-Ukraine war. My husband Lt. Col. Artur Muzyka began his military service in 1998 when he entered the Poltava Institute of Communications. In 2004, we got married. In 2005, our son Mark цфы ищктю We were a strong and friendly family. The son followed his father Mark, copied his manners. We traveled throughout Ukraine together with my husband in his service issues. And for five years we had lived in Kyiv. He served in the Directorate of Communications of the General Staff of the Armed Forces of Ukraine. In February 2015, he went on a combat mission to the city of Debaltseve in the war area in the Eastern Ukraine. When driving the car the crew was ambushed near the village Lohvinove and the whole crew was killed by the hands of Russian invaders. With the help of volunteers the body of my husband was found nearly a month later. March 5, he buried in his homeland in the Kirovograd region, town Ulianivka. By the Order of the President of Ukraine of 19.05.2015 he was assigned the next rank of colonel (posthumously) and was awarded the Order of Bogdan Khmelnitsky, III degree (posthumously). Once upon a time ther elived a small but very happy family in the big city of Kyiv. Mother, father, grandfather and grandmother. They lived together happily. Every morning, I saw smiling loving eyes of mom and dad. Dad and Mom worked, I went to school. Most of all I liked the weekends - for me they were each a little holiday. Waking up in the morning I knew I was in for a surprise, prepared by parents. Because on Saturday and Sunday, our family always traveled. It did not matter where to, whether it was a trip to the forest, the river, or a trip to another city, an entertainment center, or a museum - we were a happy family. Dad always taught me to be a real man. And I liked our little secrets, mine and dad's: another candy, more ice-cream. And most importantly, we have had a common dream with my dad, but it was destined to fail, because the war began. Together we wanted to have a little sister for me, and daughter for my father. My father, like a real man, having received the summons, went to defend our homeland in the Eastern Ukraine from the Russian aggression. He loved me and mom, and protected us from unnecessary hassles, so even in the Russia-Ukraine conflict zone, he was telling us that he was at the site in the Lviv region. My father was to come for vacation on Christmas holidays and at the same time to celebrate his 45th anniversary. He always kept his promises. But unfortunately, this promise was very painful and bitter. January 5, my mother and I could not get through to father on the phone. But there was another call... After that we were visited by two soldiers, and they told that my father's heart stopped during guard duty. My dad was buried on the eve of his birthday. Since that time, my happy childhood ended - there is no such fun weekend. And the most painful for me - my mother's eyes. She is still smiling at me, but I see the sadness in her eyes, and tears. Volodymyr Chaplinski, like thousands of Ukrainians, went to the Maidan to express his protest against the policy of the state authorities and to defend the civilized choice of Ukraine and prevent the bloodshed, in which the authorities wanted to drown the free people. Being there since the first days on the Maidan, Volodymyr joined the first night duty, because he believed that the experienced men like him had to stand the watch. "My husband is not a supporter of either the European or the Customs Union. But he has always said that the Ukrainian nation is very wise. It is unfair that we live so poor. After the students were beaten he could not keep silent any more. Then Volodymyr said that it was time to rise from the knees, and went to the Maidan", says Volodymyr's wife Svitlana. Volodymyr Chaplinski on the Maidan was not included in any hundred. Since the first duty, he was by himself, and later made friends with other protesters. "At first, he stood his duty in the open air near the burning barrel. Then, together with the guys, they set the tent. It was his place... you see. Then he died near it" sais Svitlana barely holding back her tears. Volodymyr left two children: son Volodymyr, who is studying at the university and an 8-year-old daughter Violetta. "Every day it gets more and more difficult", says Svitlana. "You'll have a hard time trying to find a family like ours. Over 22 years of marriage we have never raised a voice against each other. Husband did everything so that we lived in abundance". When in 2006 the family suffered a distress after they lost their newborn twins, only Volodymyr was able to lead his wife out of a deep depression and return to her faith in the future. And in 2008, Svitlana gave birth to a long-awaited daughter. Volodymyr was a master of all trades. Fixed watches, went in forsports, loved to travel, and most of all he loved spending time with his family, for which he will remain forever an example of fairness, decency and patriotism. His 8-year-old daughter Violettta dreams of her own bike. Today, the family of Volodymyr Chaplinski is supported by the charity Platform People Help The People. You can provide help follolwing the link to the Chaplinskis family page. PEOPLE HELP PEOPLE! WHO DO YOU HELP?! Valeri Bonyakivski went to Russia-Ukraine war as a volunteer, to protect Ukraine from Russia-supported terrorist groups in the Eastern Ukraine. As a reserve officer, he was remaining faithful to the oath as hundreds of other best sons of the Ukrainian nation; he could not calmly watch the events in the country. So, to stop the Russian aggression and maintain peace in our homeland, Valeri changed his everyday life, a warm family atmosphere, care of the wife and daughter for the thorny path of the warrior. 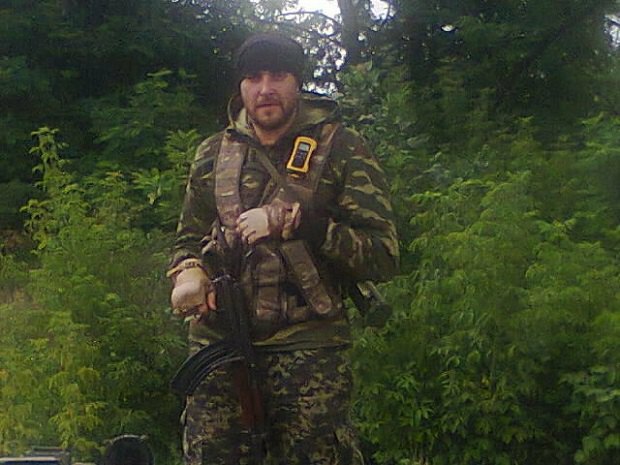 The life of Valeri Bonyakivski ended on October 16, 2014, as a result of mortar attack near the village Netaylovo, Yasinuvata district, in the Donbass, east Ukraine. He is head of the reconnaissance and sabotage group, together with his subordinate Ukrainian soldiers settled out for a mission, from which, unfortunately, he was not destined to return. Valeri’s name is forever imprinted in people's memories and in the recent history of Ukraine as an example of invincibility, the strength of spirit, and the service to his people and country. The hero was posthumously celebrated at the state level, awarded the Order “For courage” III degree, the honours "For the faithful people of Ukraine" and the degree and medal from Ukrainian Orthodox church Kyiv Patriarchy "for sacrifice and love for Ukraine". But the most precious thing that was left behind is his dear ones. His family is now under the guard of People Help The People, the charitable Platform of the direct targeted assistance to the families of Ukrainian soldiers killed in the Russia-Ukraine conflict zone in the east Ukraine. "Valeri was a kind man with a big heart", this is the first thing his wife says about Valeri. The woman says that she met her future husband yet in schooldays. Even then Valeri always had his own opinion, was fair and ready to help. Since his childhood, Valeri wanted to fly, so straight from school, he entered the pilots’ school in Luhansk. His military base stationed at the time in Grozny, Chechnia. That's when he first felt the Chechen hospitality: afternoon the Chechens smiled friendly, but at night "treated" with shelling. Halyna recalls the stories of her husband about Chechen hirelings in the ranks of the terrorists in the Donbas. "Since childhood, Valeri loved to draw, this was useful in hard times. After the disbandment of his military unit, the pilot career was interrupted. Valeri became an artist, painted the pictures, was a member of the Artists' Union, made tattoos for famous people in Poltava", says Halyna. You can help Marta, the daughter of Boniakivski following the link to the family page. Today Halyna Boniakivska masters a new profession, because she understands that now the future of her daughter depends only on her. Of course, the father will never return. Anything we can do for them is to try to help the Bonyakivski’s family. Give good emotions and necessary things. Marta needs a bed with orthopaedic mattress and a tablet. The public charity Platform People Help The People calls upon all people of good will not to stand by but help Marta. "Children are the only thing that keeps the widows in this world. They are the reason to live", says Halyna Boniakivska, the widow of a fallen hero. PEOPLE HELP THE PEOPLE! WHO DO YOU HELP? !